Jack holds a B.M.Ed. from Combs College, PA, where he studied orchestration and composition under the reknowned Romeo Cascarino and John McIntyre. He also studied advanced harmonic techniques with American virtuoso jazz guitarist Dennis Sandole of Julliard, whose students included top jazz artists in the music industry. Jack has been a life-long music educator, professional entertainer, bandleader, singer, arranger, composer, has performed throughout the US, Canada and The Islands, and has worked with celebrities and recording artists. 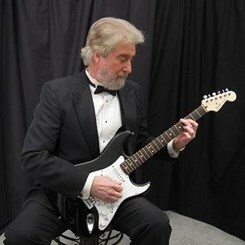 He was founder/director/owner of a music academy in FL, endorsed by county school band programs. He served on the faculty of several music schools in PA, FL, NC. Jack teaches Guitar (all styles) and Bluegrass Banjo at Music and Arts, Charlotte/Arboretum (since 2006).